Committed to Patient Care. Committed to You. Benefis HealtH sYstem We are recruiting for a full-time HCBS Nurse Case Manager LPN/RN at Our Billings HCBS. This position includes benefits and no weekends or nights required. 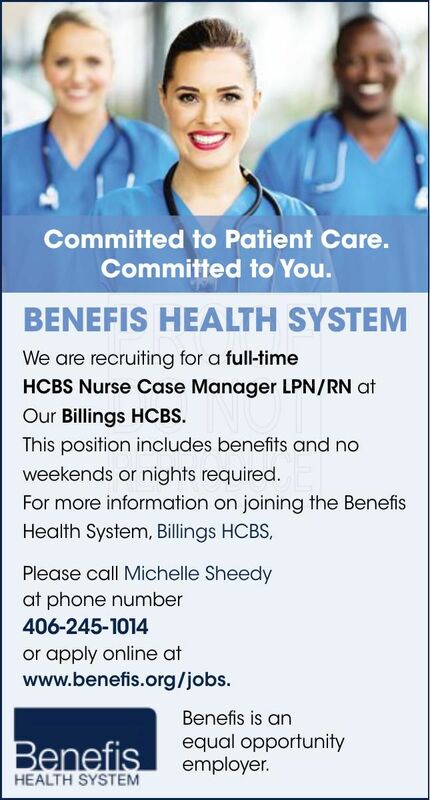 For more information on joining the Benefis Health System, Billings HCBS, Please call Michelle Sheedy at phone number 406-245-1014 or apply online at www.benefis.org/jobs. Benefis is an equal opportunity employer.